Ok, so I have my receiver in the case. It has a single set of AV outputs. I need to route the video to the 7" monitor and to the DVR, both of which do not have AV pass-through, and to an external port on the case for the FatSharks. I'm afraid that if I just use an RCA "Y" cable or two to split the video, that the signal will degrade to the point of being unusable. 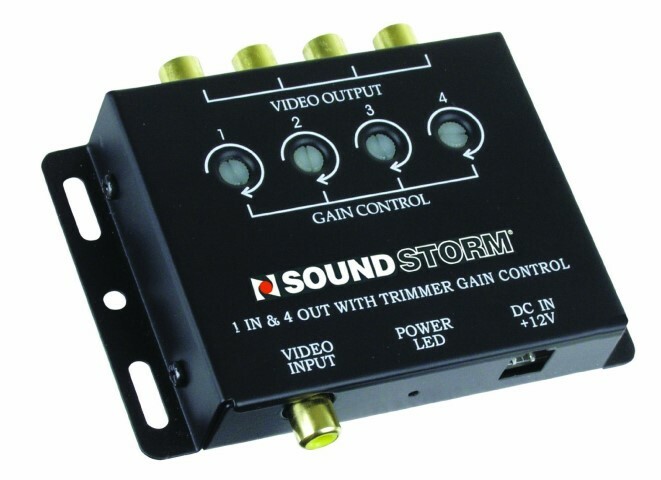 Does anyone know of a small RCA video splitter (5v or 12v) that can split video into three? Or even two? I used a cheap Y connector. It wasn't good at all. Both images were very dark. The Radio Shack salesman told me to use a video splitter because it has a built in amplifier. I haven't done that yet because I've already spent my allowance for the week. I found this one for $12 on Amazon, so I thought I'd give it a try. But I'd still like to hear what others are using in their setups. I saw a couple of others but this one was a bit smaller so it should fit better in the case. I think it may be like playing a game of tetris by the time I get everything that I want packed inside. I've used one similar to that, a BOSS BVAM5, which worked well. Right now I have an Eagle Tree diversity controller in my ground station that also has a video splitter in it, so I use that. It works well also. Ideally you don't want to use a hard wired splitter because composite video signals are intended to use with a known "load" on the output. (standards is 75ohm) When you parallel two loads on one output, "Ohm's law" dictates that the load present on the output is cut in half, or theoretically 37.5 ohms if everything were perfectly in spec. That's half the resistance to ground, so the video signal is pulled too low and out of spec. This results in a picture that's too dark as mentioned above, and some equipment will see this as no valid signal at all. Some screens and recorders will go blue screen, "no signal" or whatever they normally do with no input. Yup, that's just what I want to avoid. I was planning to get a DVR with video pass through, but this old camera fell into my lap for free. Even if I had gotten the DVR as I intended, I still would have had to split the video for the goggles. I have two receivers.. There cheap, and i kinda have more receivers that transmitters anyway.. The receiver I have has 2 video out's on it. Not that that helps you any now, just saying you can get them that way as well. Which brand, model and frequency do you have? I know that some come that way, and I intended to get one with that feature. Unfortunately, I neglected to check when I ordered mine. I got the FoxTechFPV.com 1.3 GHz model. I got this one, but as you can see, I'm on 5.9GHz...They also make one in 2.4. I did go with circular polarized antenna's though, but for wooded areas, I'm thinking about trying 900mHz.